By the time E3 2017 rolled around, Nintendo Switch was barely three months old. Coming off the success of The Legend of Zelda: Breath of the Wild, what other exciting things were planned for year one of Nintendo’s newest system? Going into E3, the company had the wind at its back, but it still had a lot to prove. Nintendo’s showing, as it was in previous years, was quite different from Microsoft’s and Sony’s. It was not an hours-long live stage show but a 25-minute pre-recorded video presentation. Of course, once the presentation was over, it the live stream neatly segued into “Treehouse Live,” a three-day extravaganza of Nintendo content live from the E3 show floor that had its own occasional announcements. The big presentation, which aired on June 13 and focused on Nintendo Switch, began with a highlight reel of previously-announced games including Arms, Rocket League, Splatoon 2, Pokken Tournament DX and FIFA 18. Afterwards, president of Nintendo of America Reggie Fils-Aime appeared to show off new games. The promise: The first trailer was for the latest in the Xenoblade series, Xenoblade Chronicles 2. The JRPG adventure to the fantasy world of Elysium would begin during the 2017 Holiday period, on Nintendo Switch. Did they deliver? Yes. During Nintendo’s September 2017 Direct, the game’s release date was announced as December 1st. Sure enough, Xenoblade Chronicles 2 met its promise for the holiday window schedule. The direct sequel with a wonderful soundtrack subsequently received DLC, with more planned as part of its $30 expansion pack. The promise: Lovable pink puffball Kirby would be making his Nintendo Switch debut. He would also be making—and bringing—friends to his adventure in 2018. Did they deliver? It’s good to be a fan of Kirby because that usually means a frequent batch of experimental (and good!) titles for the adorable little dude. As with Kirby Star Allies, this is also true. Partially. The game released on March 16th, meeting its E3 2017 promise. Unfortunately, as good as it is to be a fan of the long-running series, sometimes the games aren’t all winners—something EIC Stephen Totilo discovered with Star Allies. The promise: Space, the final frontier… oh. Wrong franchise, but surprise: A beloved Nintendo sci-fi series made an unexpected appearance, at least for the few seconds that the title-card trailer rolled. Listed as in development for Nintendo Switch, Metroid Prime 4 would be coming at an unspecified date. Did they deliver? Not yet. Information has been light since, and the only thing we really know is that Retro will not be making the game. Perhaps we’ll hear more at this year’s E3. The promise: Beaming back to earth—a colorful cardboard cutout version of one, anyway—the next trailer invited us to a first look at a new Yoshi adventure. The yet-unnamed Nintendo Switch platformer would be available in 2018. Did they deliver? Not yet. We’re still waiting to hear more on this cutesy game that lets players journey through its stages and the hilarious ‘flip side’ showing how its world is cobbled together. The promise: Koei Tecmo Games’ Musou series would get yet another spin-off, but with a Nintendo twist, as evidenced by the trailer for Fire Emblem Warriors. The game would release in Fall 2017. Did they deliver? Yes. Fire Emblem Warriors released on October 20, 2017 on both Nintendo Switch and New 3DS. The game mixes strategy with ridiculousness, and follows the story of the royal twins of the Kingdom of Aytolis, with guest appearances from characters in past Fire Emblem games. The promise: The Legend of Zelda’s series producer Eiji Aonuma presented next. He re-confirmed the news that select Zelda items would be available in the Nintendo Switch version of Skyrim. Did they deliver? Yes. On the The Elder Scrolls V: Skyrim front, the Nintendo Switch version with in-game Zelda items, and the added bonus of portability, released on November 17th. The promise: Additionally, trailers for the DLC packs of Breath of the Wild were shown. Trial of the Sword, Hero’s Path Mode, new armor, the Korok mask, and Master Mode would be a part of the first expansion pass called The Master Trials, available for purchase on June 30, 2017. The second DLC pack, The Champions’ Ballad, would focus on the game’s four champions, and would be available during the holiday season in 2017. The four characters would also be receiving the Amiibo treatment. Both DLC packs would be available for Nintendo Switch and Wii U. Did they deliver? On June 30th, the first DLC pack released, which included the awesome Hero’s Path among other things. And the wonderful and challenging second DLC pack released on December 7th. The Amiibo released in November, too. 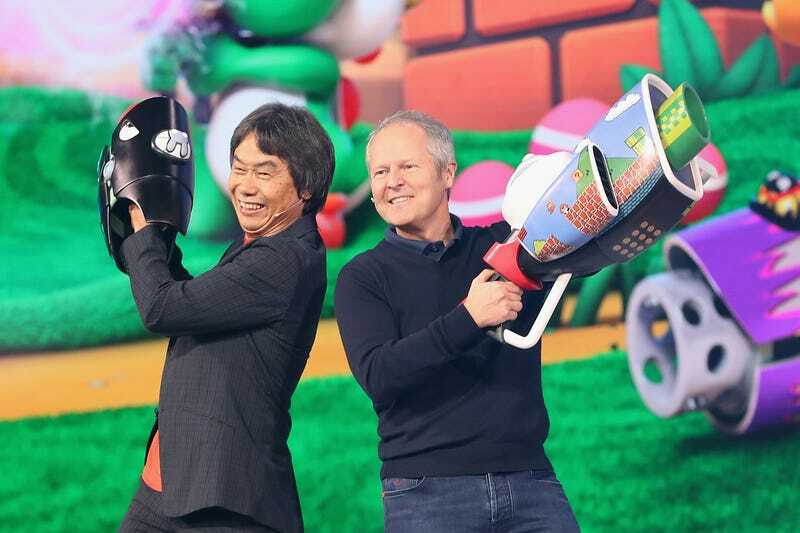 The promise: The unlikeliest crossover was up next, with Ubisoft president Yves Guillemot on presentation duty. Mario+Rabbids: Kingdom Battle would have the Rabbids invading Mario’s world in this Nintendo Switch strategy RPG. The Ubisoft game would release on August 29, 2017. Did they deliver? Yes. The XCOM-like game with a less intense plot but fairly intense strategy launched for Nintendo Switch on August 29th as promised. And man, this weird crossover is so surprisingly great. The promise: Rocket League was the subject of the next trailer. Included in the Nintendo Switch version would be exclusive customization such as Mario and Luigi hats, battle-cars, and cross-network play. These would arrive with the game’s holiday 2017 release. Did they deliver? Indeed. The soccer game starring cars became available on Nintendo Switch on November 14th, 2017. It features cross-play with Steam and Xbox One users, and Nintendo-themed toppers and cars. There’s a physical copy of the game on the market, too, which released earlier this year. The promise: A scary-looking tyrannosaurus trampled through an open field in the next trailer. On its head, a cartoonish red cap with big eyes. And under the hat, the mustachioed icon: Mario. The plumber ...uh...adventurer… um... the plumber is seen running through various colorful worlds to the tune of a jazzy theme song with actual vocals and lyrics. Super Mario Odyssey would be available on Nintendo Switch on October 27, 2017. Did they deliver? Yes. The fantastic platformer with lots of collectibles and outfits kept its release date promise. Speedrunning, glitches, a balloon mode DLC featuring the awesome brother, and more has kept the game interesting long after the Odyssey launched and moon collecting began. That was it for Nintendo’s E3 2017 showcase, but there were a couple of things of note which came via the Nintendo’s Treehouse live stream. The promise: While this game was not announced during the Switch-focused E3 2017 video presentation, the 3DS was not forgotten. Metroid: Samus Returns received a surprise announcement during Nintendo’s Treehouse live stream. The remake of Metroid II was basically finished when Jason Schreier got some hands-on time with it during E3 last year. And its release date was slated for September 15th of the same year. Did they deliver? Yep. Metroid: Samus Returns released for the 3DS on the 15th day of September, as promised. And the game is legit. The promise: Another game that was left to the Treehouse live stream on Day 2 was what was then a 3DS exclusive, Sushi Striker: The Way of Sushido. The game would arrive in 2018. Did they deliver? Not yet, but it’s going to overdeliver very soon: Sushi Striker will be available tomorrow, June 8, for 3DS and Nintendo Switch both. The promise: Here’s another game reveal from the Treehouse live stream, but this one wasn’t much of a surprise if you read Kotaku, because it had leaked back in April. Mario & Luigi: Superstar Saga would be getting a remake. Fawful would chortle his way on to the 3DS on October 6, 2017. Nintendo fared well on delivering what it promised from last year’s E3. A few games are still out there to meet that “2018” release window, but hey, there’s still a little less than half of 2018 to go. So, we’ll see. We’ll also see what’s in store as the Nintendo Switch’s second year continues on. And with that, this concludes our look back at Microsoft’s, Sony’s and Nintendo’s E3 2017 kept, broken, or yet-unfulfilled promises. It’s time to look forward to what E3 2018 will bring. It’s likely going to be much of the same: Lots of talk and hype, about which we should have reasonable expectations.